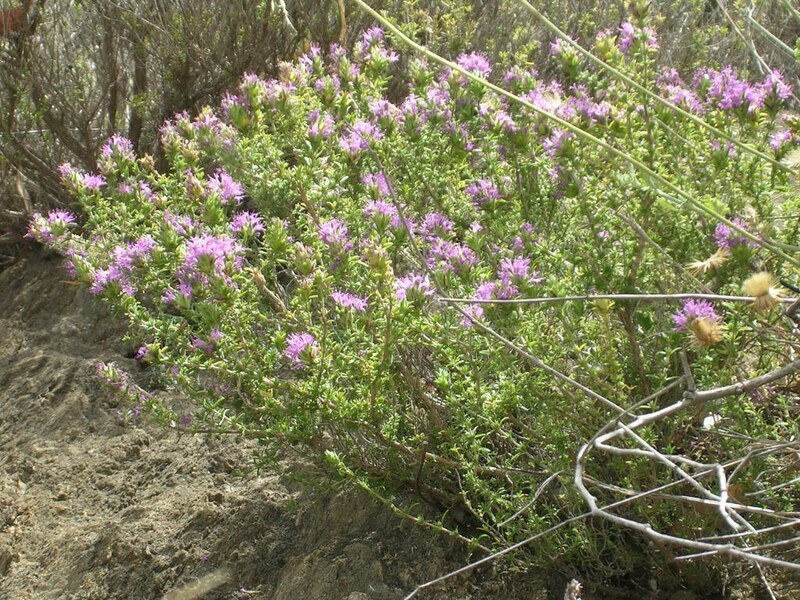 Wild thyme in bloom on a hillside. Clumps of flowering thyme on the sun-baked hillside near my house give off a powerful scent. They attract me and the bees. I pick handfuls of the herb to use in the kitchen, to dry for future use. 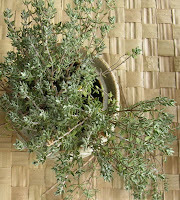 I think thyme is my most favorite herb, so redolent of Mediterranean landscape. 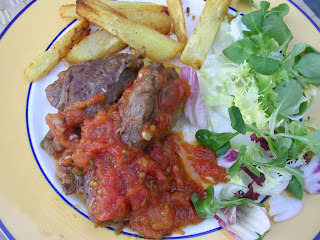 I scatter it over simple roast chicken, pork and lamb, add it to soups and stews. With thyme on my hands, I’m looking for other ways to cook with it. 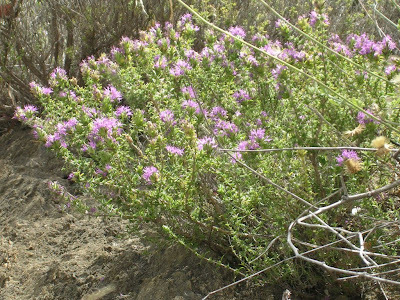 In spite of its availability, thyme is not widely used in the traditional Spanish kitchen. 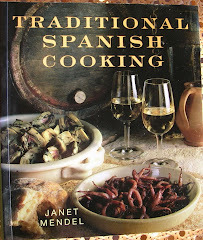 Parsley is absolutely the favorite herb in Spanish cooking. Oregano is widely used, especially in marinades such as adobo. While pots of basil are kept for perfuming the kitchen, the herb is never used in traditional dishes. Although, with TV chefs showing dishes from other countries, more venturesome housewives might experiment with basil. Rosemary, which also grows wild in the Mediterranean landscape, may be used to fuel a bread oven, but is rarely added to the cook pot. However, in Valencia, a sprig of rosemary is often added to paella when there is no wild rabbit or snails to provide the subtle herbal flavor. Thyme is an essential flavoring ingredient in home-cured Spanish olives (the recipe is here). And, it almost always goes into dishes with rabbit, whether wild or farmed. 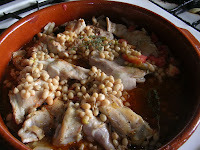 This dish is typical of Almería in eastern Andalusia. 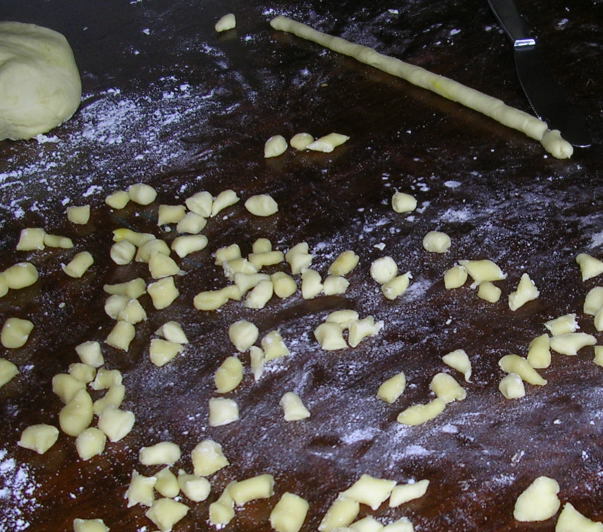 The simple pasta is made by rolling thin cords of dough, then twisting off short, pea-sized bits. The pasta is cooked right in the broth with the rabbit. If you don’t want to make the pasta, substitute packaged orzo or Israeli cous cous (which is pasta shaped in round balls). Pasta to cook with rabbit. Combine the flour and salt in a bowl or on a pastry board. Make a well in the center and add the oil, water and food coloring. Mix the flour into the liquid until combined. Turn the dough out onto a lightly floured board and knead the dough until smooth and elastic, about 5 minutes. Cover it and let rest for 1 hour at room temperature. Take small balls of dough and roll them 1/8-inch thick cords. Twist off ½ -inch pieces (or cut the cords into ½- inch lengths). Spread on a clean cloth to dry until ready to use. The pasta can be thoroughly dried and stored or used fresh. 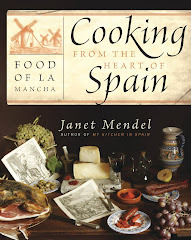 When the beans are cooked, heat the oil in a cazuela or flameproof casserole and fry the garlic. Remove garlic and crush it in a mortar. Blend in the pimentón, then the wine. Sprinkle rabbit pieces with salt and pepper. Brown them in the oil. Add the onion and chorizo and fry for 3 minutes. Then add the tomato. Stir in the garlic-wine mixture, water or bean liquid, ½ teaspoon salt and thyme. Cover and cook 30 minutes. Turn the pieces of rabbit and add the cooked (or canned) beans. Continue cooking until the meat is tender, about 20 minutes longer. Remove the sprigs of thyme. Uncover the cazuela and turn up the heat so the liquid begins to bubble. Add the pasta and cook until it is tender, about 8 minutes for home-made pasta or 8 to10 minutes for packaged pasta. Allow the cazuela to rest for 5 minutes. Serve in wide soup bowls. Thyme-scented rabbit, beans and pasta. Notes on the above: Because I was in a hurry, I bought supermarket packaged rabbit. 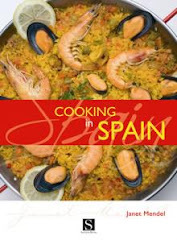 It is hacked up into small pieces, para paella. Awful, because the bone chips are seriously dangerous. Better to buy a whole rabbit and cut it up yourself or know a trusty butcher who will prepare it for you. The first really ripe tomatoes in my garden appeared only a week ago. 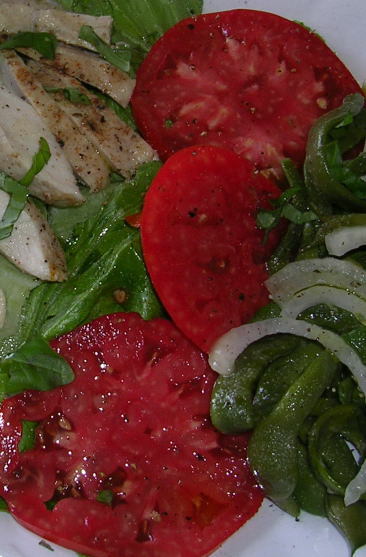 I sliced them, drizzled them with fine olive oil and ate them with pleasure. Now, they are coming fast and furious. 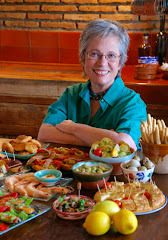 Of course, I’m making gazpacho (see my favorite gazpacho recipe here). I also have a weakness for BLTs, made with toasted whole-grain bread, homemade olive oil mayonnaise, crisp bacon, lettuce, sliced sweet onions and thick slices of just-picked, sun-warmed tomatoes. Later in the season, when the tomato wave threatens to inundate me, I’ll start packing tomatoes into freezer bags. 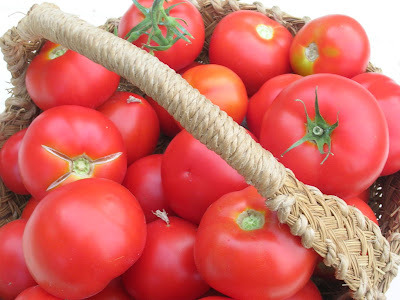 But, now I’m looking for ways to use my daily harvest of ripe tomatoes. Finally, I’m ready to turn them into sauce. One of my favorite tapa bar dishes is magro con tomate, chunks of pork braised in fresh tomato sauce. Without embellishments, it satisfies the “five ingredients or less” rule—pork, olive oil, tomatoes, garlic, salt. 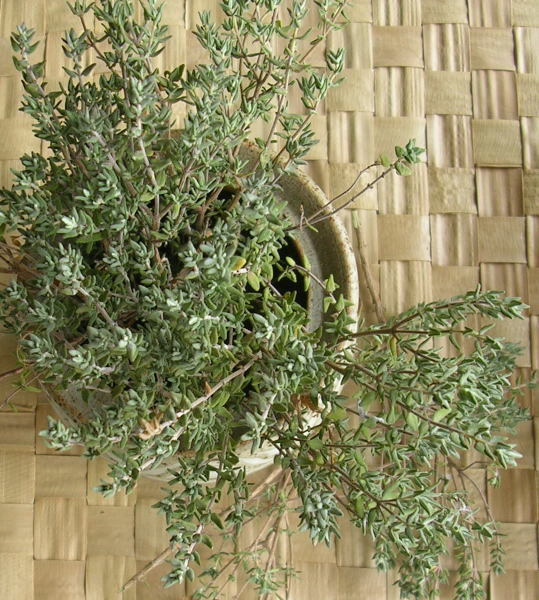 Nevertheless, I like to add fresh herbs to change the basic recipe—thyme, fennel, rosemary, oregano or basil. 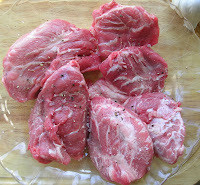 Magro means “lean,” to distinguish the meat from fatty cuts such as panceta. In fact, the dish is best made with a slightly fatty cut from the shoulder. Cut the meat into 1-inch cubes. In this version, I substituted pork cheeks (pictured at right), dollops of flesh that, slowly cooked, become wonderfully tender. 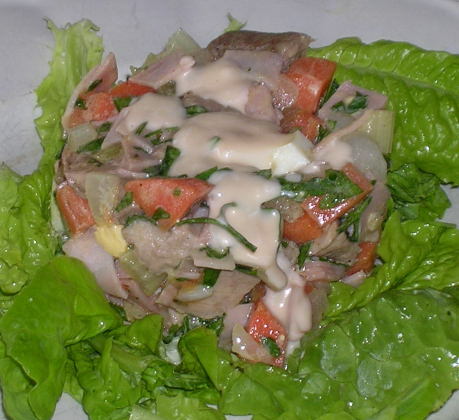 You can turn this into a sandwich by spooning the pork and sauce onto a split roll or into a main course by serving it with rice, pasta or potatoes. 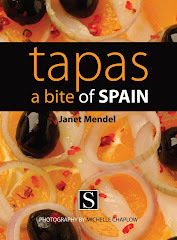 Makes 4 tapas or 2 main dishes. Heat the oil in a deep frying pan and brown the pork cheeks on a moderately high heat. Add the garlic, then the tomatoes. Turn up the heat. Add the salt, bay leaf, cumin, oregano and cayenne. When tomatoes are bubbling, cover the pan and simmer 45 minutes. 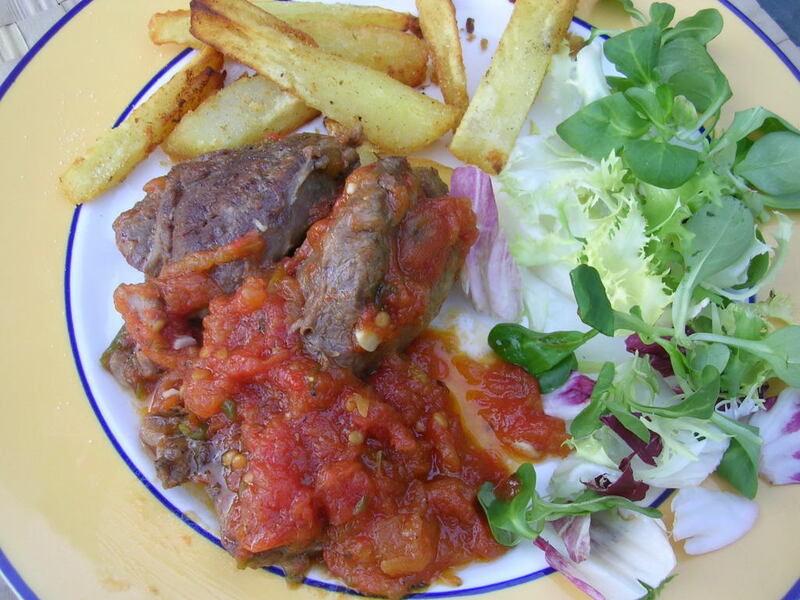 Remove cover and continue cooking, stirring frequently, until meat is fork-tender and tomatoes are almost syrupy, about 45 minutes. Stir constantly during the last few minutes, so the sauce doesn’t scorch. Serve hot. 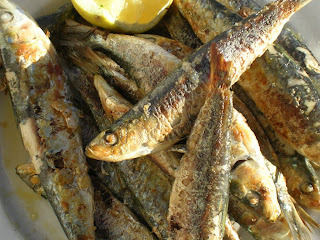 One of summer's pleasures in Spain is eating fresh sardines, roasted on a fire in the salt air at the seaside. 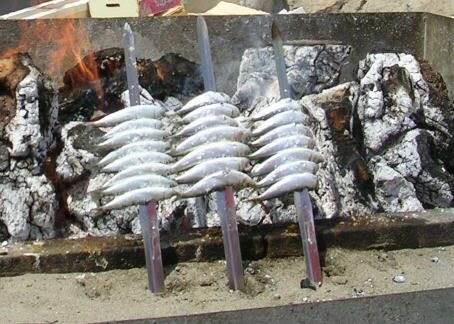 The sardines are speared on skewers stuck into the sand in front of the flames and grilled until crackly. The aroma is irresistible, tantalizing. You pick them up in your fingers and eat the flesh off the bones. Accompanied by icy, cold beer and chunks of fresh bread to absorb the drips, sardines make a memorable meal, to be followed by a plunge in the sea and a siesta on the warm sand. 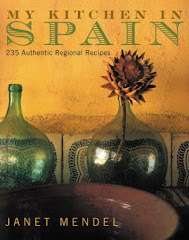 Spanish humorist and commentator on life, Julio Camba, once wrote that with sardines, you should never eat fewer than a dozen, "but watch how you eat them, where you eat them and with whom you eat them." Sardines, he added, are not to be consumed at home with the virtuous wife, but out with a shameless hussy not afraid to get her fingers greasy. "People once united in eating sardines together, will never be able to mutually respect each other again, so, when you, dear reader, wish to organize a sardine fest, choose well your accomplices." This is because the pungent salty-smoky smell of grilled sardines clings to ones fingers, chin, moustach and clothes long after the feast is finished. 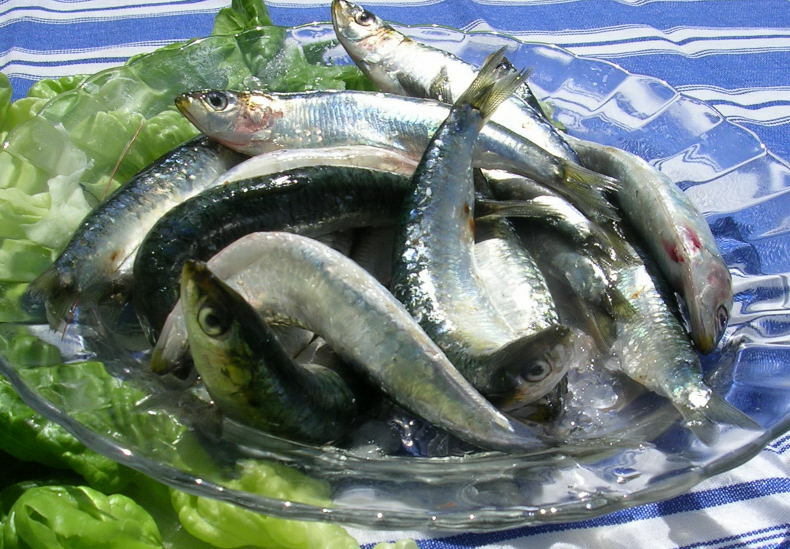 During the summer sardinada, sardine festival, in La Coruña (northern Spain), doormen at nightclubs and discos are said to spray revelers with air freshener before letting them in. Sardines grilled on the beach in Málaga are called espetones, for the split-cane skewers; in Cádiz, they're sardinadas; in Granada, moraga; in Galicia, where the fire might be fueled with wild gorse, aspetu. 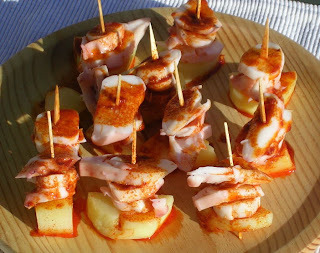 You can grill them on the terrace at home on an ordinary charcoal grill. A hinged double grill is useful for grilling sardines. Instead of turning each sardine, you flip the whole grill over. The sardines can also be grilled on a plancha, a flat grill pan or griddle. Sardines to be grilled must be absolutely fresh. Leave them whole, ungutted and unscaled. Sprinkle them with salt about 30 minutes before cooking. For added flavor, place branches or twigs of fresh herbs such as bay, thyme, rosemary or fennel on the coals. When coals are hot, brush the grill with oil and preheat it before placing sardines on it. Brush them with olive oil. Cook on both sides. Serve hot off the grill. 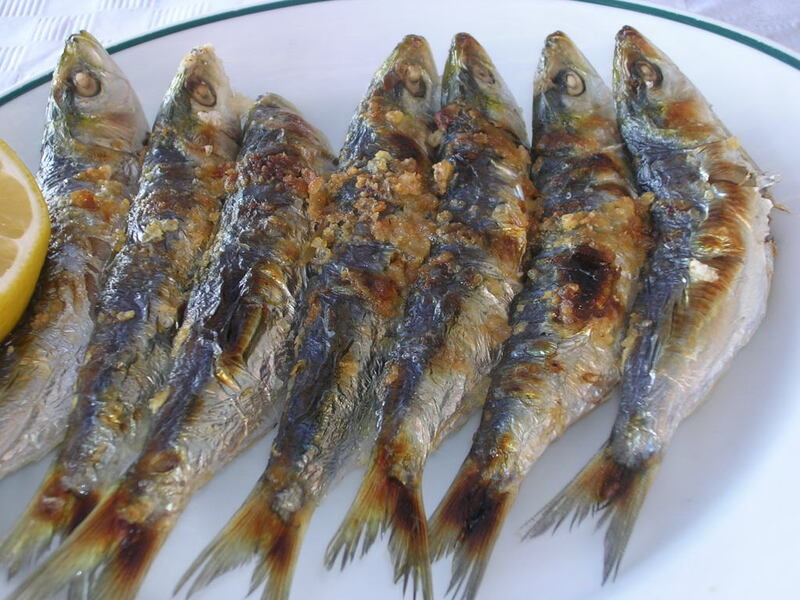 If cooking on a plancha, drizzle the sardines with olive oil and brush the plancha lightly with oil. Sprinkle coarse salt on the griddle and preheat it. Lay the sardines on the hot plancha. Turn them once to brown both sides. They’re done when browned—3 to 4 minutes per side. To eat the sardines, flake off any loose scales, then, holding the sardine at both ends, eat the flesh off one side, turn and eat the other side, discarding the head, spine and viscera. Allow at least a dozen per person. 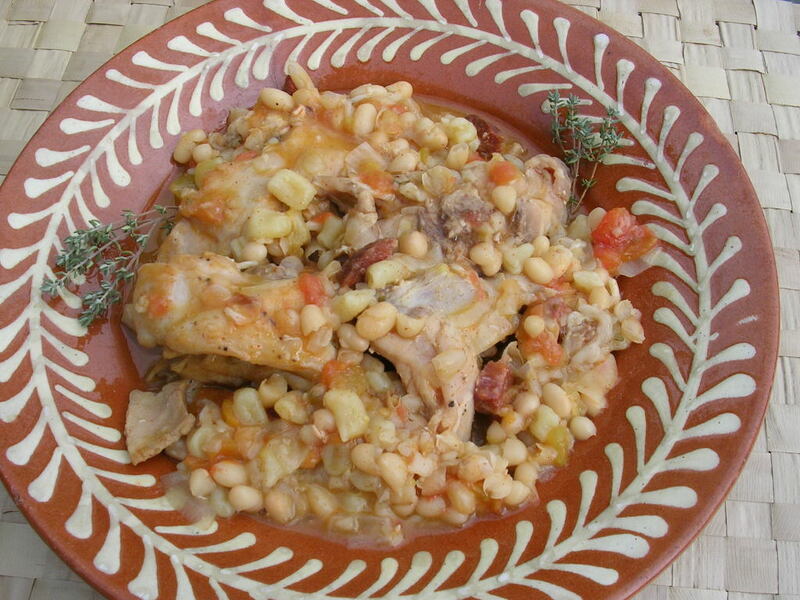 Instead of plates, use slabs of bread or, as in Galicia, corn bread or cachelos, potatoes boiled in their skins, on which to serve the sardines. If you have leftovers, strip off skin and discard bones. Marinate the flesh in a good vinaigrette and serve as an hors d'oeuvre with sliced hard-cooked egg and thinly sliced onion. For this recipe, you have to fillet the sardines. 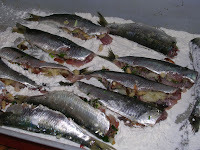 Really fresh sardines are easier to fillet if you first soak them in salted ice water for 60 minutes. Working on several thicknesses of newspaper, slide off the scales from the tail to the head. Cut off the heads and remove the guts. Grasp the top of the spine between thumb and forefinger. With the thumb and forefinger of the other hand, loosen the flesh around the spine and draw it down, “unzipping” the fillets as you go. Use kitchen scissors to cut away the spine, leaving the two fillets attached on the dorsal side and at the tail. Remove heads and guts from sardines. Butterfly them and remove spines, leaving two fillets attached along the dorsal fin and at the tail . Rinse and pat them dry. Combine the breadcrumbs, ham, scallion, parsley, fennel and currants in a bowl. Stir in the lemon juice, salt and pepper. Add 2 tablespoons of the beaten eggs to the breadcrumb mixture. Spread ½ cup flour in a shallow pan. Place remaining beaten egg in a shallow bowl. Working with one sardine at a time, spread it open on work surface. Use about 1 ½ teaspoons stuffing mixture. Press it firmly on one side of the sardine. Fold the other half over and press to seal. 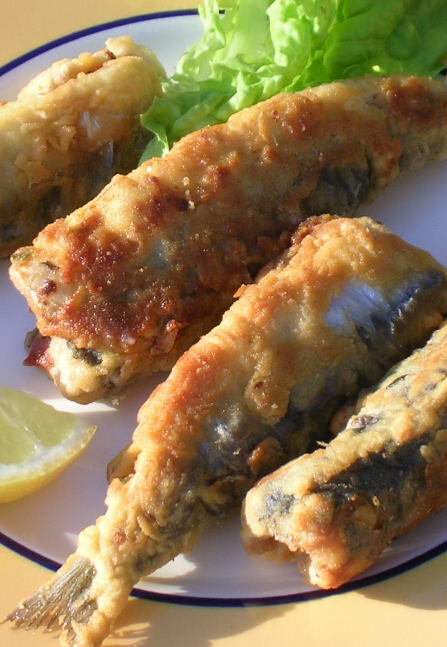 Place the sardines as stuffed in the pan of flour. When all sardines have been stuffed, sprinkle them with remaining ¼ cup of flour. Roll them gently to coat them on all sides. Dip the sardines into beaten egg, taking care to coat the open side. Return to the pan of flour. Roll them gently to coat with flour. Heat enough oil to cover the bottom of skillet to a depth of ¼ inch. Fry the sardines in batches, turning them to brown on all sides, 3 to 4 minutes. Remove to drain on paper towels. Serve hot.